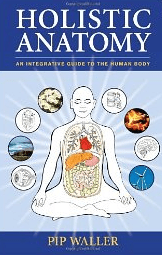 Holistic Anatomy: An Integrative Guide to the Human Body was authored by Pip Waller and published by North Atlantic. As a yoga teacher and massage therapist I have sat through my share of anatomy courses: Hours of excruciating detail, analytical doctors and chiropractors presenting bones and systems as though they were independent entities within the human form. Holistic Anatomy is a breath of fresh air for anyone who is interested in the human body but isn’t quite ready for medical school. This health book written by Pip Waller presents the materials in a holistic, big-picture way, and offers a considerable amount of detail. The book’s easy to use format makes it an important anatomy book for students, and healers within any holistic discipline. You will also find crisp and witty information on all of the bodies major systems. …plus “The Birds and the Bees,” and an entire chapter on “How The Body Systems (and Everything) Interconnect. In short, this book is easy to read and reference and would complement any adult education anatomy course or home library. The text would also be useful for home school education as well as acupuncture, chiropractic, massage and yoga education. I just wish Pip had written it ten years ago.